Life with MS. You never wake up alone. In the first five minutes of waking up, facial pain pulls my left cheek west, while my eye wants to move north, and my scalp just seems oblivious to any sensation at all. Fantastic! Just the way I want to feel on any given day! One by one, about ten medical students passed by my examination room, as if they were my real neurologist already. I love that bit of drama they bring to their mock exams. So professional already. I could play as nicely or awfully as I could. Not a huge task, since I sometimes have both angel and wicked witch on each shoulder, battling it out between each other. But not that day. Nope. Last Saturday I was just… me… No added sin or shame, angel or witch, drama or down-played cool. “Any other symptoms, surgeries, illnesses?” I am asked. Laughing again. Optimism is key. See the good in every bad seed. “Clinical presentation?” Neurological exams seem to go well, all ten of them. Finger-nose-finger searches, cerebellar or intention tremor back, but no biggie. Leg strength, not up to much, walking at a snail-pace-rate sometimes. Indifferent Babinski reflex one minute, pronounced the next. “Ataxia” one of the students says. And then another one, and another one. Hey, have you lads been comparing notes, or what?! “Hyperreflex“ most of them also say. Wobbly. Wob-be-ly–oooooh! Three steps and I tumble left or right. Not OK.
“Autonomic Dysreflexia is hyperreflexia.” OK. Nearly kicked a couple of students in their chin when their mighty hammer hit my knee. Don’t blame me, I hardly ever smack my own knees with a hammer at home, it doesn’t seem like a very healthy thing to do. If I even have a hammer. Yeah, where has that hammer gone to?! What? How on earth did I end up in a House, M.D. episode? What do you mean my “leg reflexes are as hyper as those of a fourteen year old, but abnormal for someone my age to have?” Jeez, I should be the next Number 10 in Irish rugby, or a place kicker in the NFL. A boot to match all the MS silliness in my brain. Day over. Mightily tired, but feeling good inside my heart. Helping students take a peek in what is supposed to be my brain, feels as if I’m at least a tiny part of the very big question they will have to ask themselves further down the line. Neurology? Or not neurology? And you know what? You can call out new symptoms, or upgrade those that went away are came back with a bang. 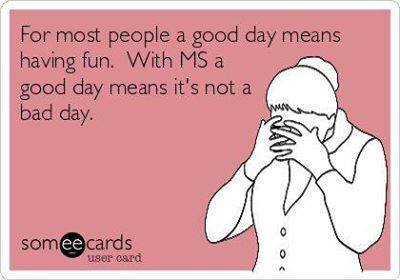 You’re not getting me, you hear me, you disgusting, little, freaky thing that calls itself MS? You. Will. Never. Beat. Me. I agree with Martha, like is hardly the right word, nothing I can say is. Respect to you. I feel your pain (well, not your *specific* pain, but hopefully you know what I mean). Sending you out hugs. Stay strong. Hope you feel better each and every day! Terrific attitude! For your ataxia, keep an eye out for BalanceWear Weighted Vest when it makes it’s way to Ireland. Really helped with my balance and falling! OR, when you’re feeling better…road trip! Be well friend! I personally like it best when symptoms disappear as soon as an M.D. appears. Sounds like you really know how to have a good time! Ah! So the feeling of a nail going through the back of my eye -which I have had before -hmmm, could be MS related?? Could be optic neuritis, Sarah. Had that before being diagnosed. On the other hand, it could be bad migraine or cluster headache also. I’d get myself checked out so. Will keep my fingers crossed for you! My “like” means something more along the lines of appreciate. Sigh. Thanks Martha, I really appreciate it!